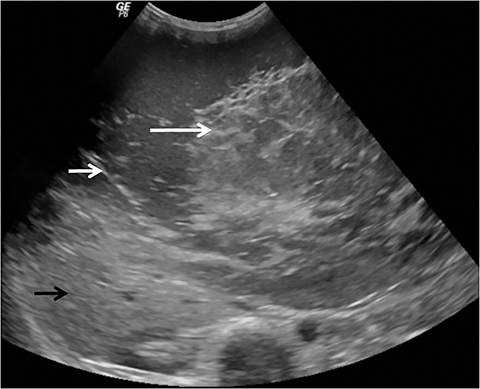 A 59-year-old woman presented with complaints of gradual fullness of right upper-abdominal quadrant and an increase in abdominal girth for the past 8 years. More recently she had been experiencing a dull abdominal ache for the immediately preceding 2 months. Her bowel and bladder habits were normal. Her physical examination revealed a distended abdomen but no tenderness. Her vitals were stable. The routine blood and urine tests were unremarkable. 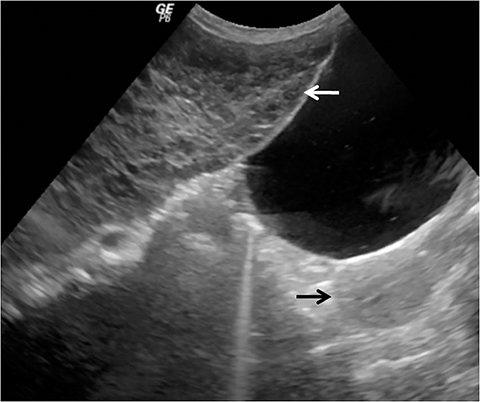 On sonography, a large, predominantly cystic mass with multiple, thin septations was seen extending from the right sub-diaphragmatic region to the urinary bladder (Figure 1). Both ovaries were seen separately. The liver appeared as a large complex mass with multiple small hypoechoic lesions throughout the liver parenchyma. 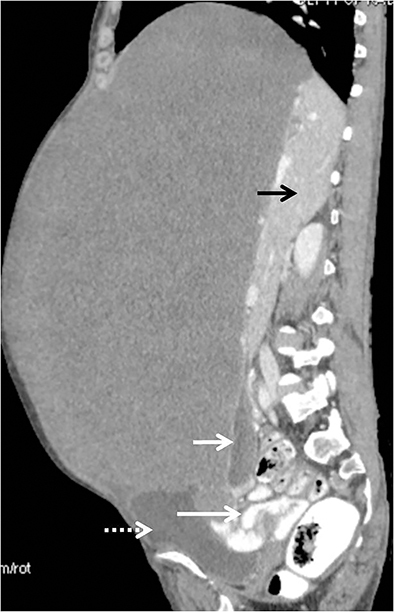 To properly characterize these hepatic lesions, contrast-enhanced computed tomography (CECT) with triple-phase hepatic scanning was performed on a 64-slice GE Lightspeed Xte. The scan revealed a large, hypodense mass involving both lobes of the liver and measuring 27 × 24 cm with a craniocaudal extent of 32 cm. It showed peripheral nodular enhancement in the late hepatic arterial phase (Figure 2A) which persisted on the portal venous phase with centripetal progression (Figure 2B). On delayed images taken after 15 minutes, the puddling of the contrast became isodense to the normal liver parenchyma and showed further centripetal fill-in. However, a large central part of the mass remained hypodense with no contrast uptake, which was attributed to huge cystic degeneration of the mass (Figure 2C). Also, there were a few foci of calcification in the mass (Figure 3). The mass had a significant mass effect on the adjacent structures and vasculature. The gallbladder was seen just above the urinary bladder (Figure 4). 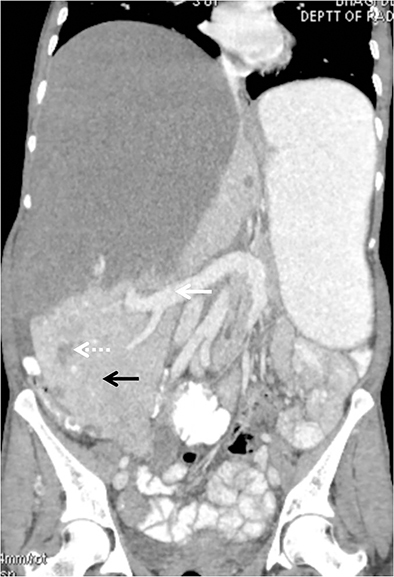 The portal vein was pushed inferiorly (Figure 5). 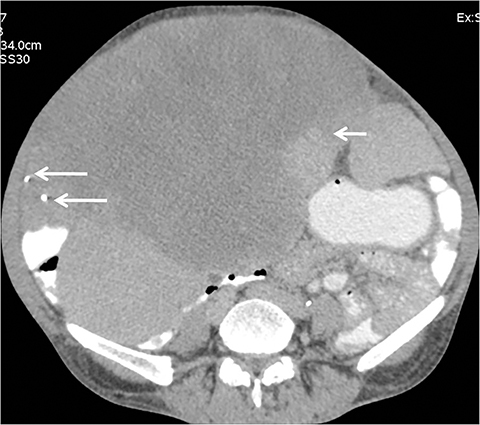 Apart from this large hepatic mass, multiple small, hypodense lesions were seen in the rest of the liver with a contrast-enhancement pattern similar to that of the large mass, except that all these smaller lesions showed complete fill-in and were isodense to the liver parenchyma in delayed CT images (Figure 2). The patient was also subjected to MR imaging. The large lesion showed hyperintense signal on T2-weighted images which increased with TR (Figures 6). Biopsy may result in lethal hemorrhage; hence, diagnosis rests solely upon imaging. On ultrasound, a typical hemangioma appears as focal, echogenic and homogeneous lesion and is hypovascular on color flow Doppler imaging. As size increases, the lesion becomes more heterogeneous with intervening hypoechoic areas. Atypical hemangiomas may appear hypoechoic even if small. 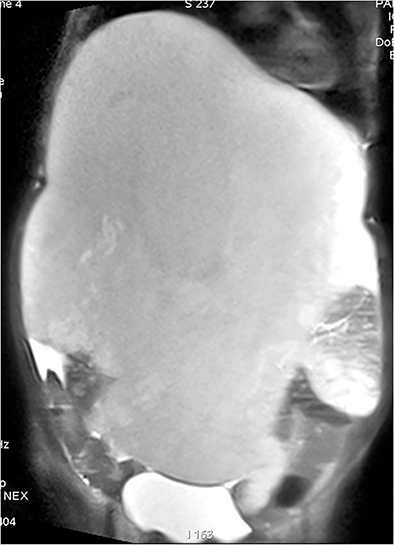 The imaging findings are pathognomonic on triple-phase CT or MR imaging. Three patterns of enhancement may be seen. The first consists of flash-filling hemangiomas that show immediate and persistent homogeneous enhancement. The second consists of peripheral nodular enhancement with central fill-in and complete homogeneity of the lesion. The third pattern is similar to the second except for a persistent, central, nonenhancing area representing cystic degeneration or scar. In hemangiomas, the venous channels are wider than their arterial counterparts, allowing slower flow and gradual fill-in. The heterogeneous enhancement may be secondary to thrombosed vascular channels, serous fluid-filled cystic cavities or central scarring secondary to ischemia or hemorrhage.3 Calcification may also be seen in hepatic hemangiomas similar to hemangiomas seen in other body parts. MR imaging has a high sensitivity (98-100%) and specificity (92-98%) in the diagnosis of hepatic hemangiomas.3 They show decreased signal on T1-weighted imaging and markedly increased signal on T2-weighted imaging, which further increases with TR. The internal septae and central scar are hypointense. On conventional angiography, small lesions appear solid. Larger lesions may not show complete opacification or may show typical “cotton wool” or “snowy tree” appearance after 2 or 3 seconds of contrast injection. However, this invasive modality is not routinely used for diagnosis. Giant hemangiomas are a subset of hepatic hemangiomas. They can reach enormous size and may present with symptoms secondary to their mass effect or complications. Treatment in these cases depends upon the size of the hemangioma and the amount of remaining normally functioning hepatic tissue. 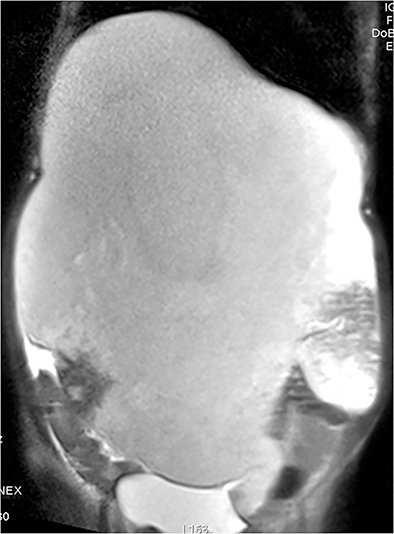 The diagnosis is radiological with classic imaging features. Hui Jiang, Zheyu Chen, Pankaj Prasoon, Hong Wu, and Yong Zeng. 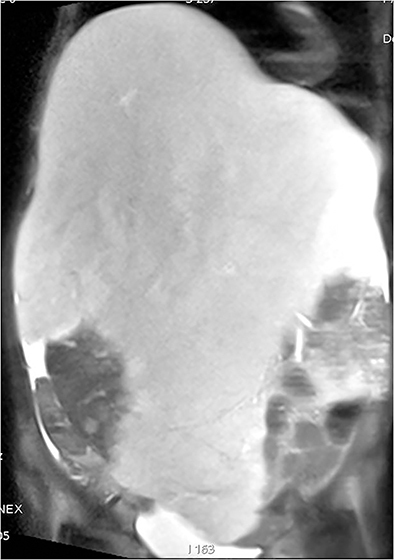 Surgical management for giant liver hemangiomas greater than 20 cm in size. Gut and Liver. 2011;5(2): 228-233. Saadeh S, Mullen KD, Carey W, et al. Infarcted giant liver hemangioma presenting with signs of acute inflammation. Pract Gastroenterol. 2003;March: 68-72. Prasanth M, Prasanna, SE, Fredericks, SS, et al. Giant cavernous hemangioma. Radiographics. 2010;30:1139–1144. Mohan S, Gupta A, Verma A, et al. 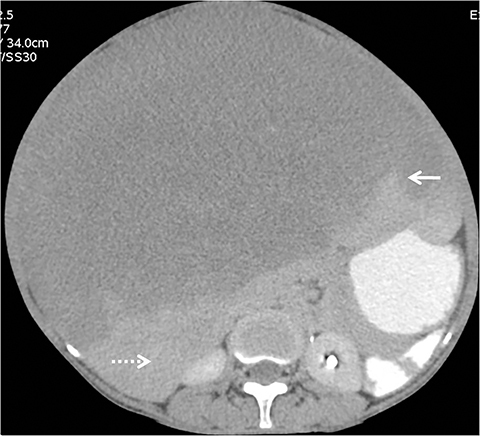 Case report: Non-surgical management of a giant liver hemangioma. Indian J Radiol Imaging. 2007; 17(2): 81-83. Jhaveri KS, Vlachou PA, Guindi M, et al. Association of hepatic hemangiomatosis with giant cavernous hemangioma in the adult population: Prevalence, imaging appearance, and relevance. AJR. Am J Roentgenol. 2011;196:809–815. Aslan A, zu Vilsendorf AM, Kleine M, et al. Kasabach-Merritt syndrome due to hepatic giant hemangioma. Case Rep Gastroenterol. 2009;3:306–312. Radiological Case: Giant hemangioma in a liver studded with small hemangiomas. Appl Radiol. Prepared by Dr. Shruti Thakur, Dr. Makhaik, Dr. Tomar, Dr. Charu S. Thakur and Dr. Venket while at the Department of Diagnostic Radiology, Indira Gandhi Medical College and Hospital, Shimla, Himachal Pradesh, India.